Can-Gest is a traditional blend of eight herbal extracts that have been presteeped for optimal assimilation. Together these herbs help nourish the digestive system and help maintain the eliminative system. Can-Gest is 100% free of harsh acidic substances or enzymes that can cause further irritation to a sensitive digestive system. This product has shown noticeable improvement from symptoms of heartburn, acid reflux, bloating, gas, constipation, and other digestive problems. Many studies have shown that the usual American diet is rich in fat, sugar, calcium and phosphates, and low in fish, vegetables and whole grains. This typical diet does not provide the necessary amount of essential nutrients (like magnesium and potassium) and can actually block many nutrients in your diet from being absorbed in the intestines. 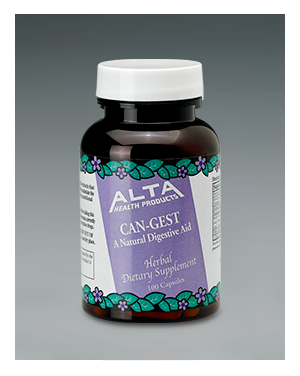 Can-Gest supports the natural functions of the digestive system, helps to clear stagnant waste, and is thought to aide in the absorption of essential nutrients. The founder of our company, Richard Barmakian, N.D., studied in Paris, France with Dr. Louis Kervran. He traveled to Canada and studied under Alma R. Hutchins, a protégé of Natalie and N.G. Tretchikoff, well-known Russian herbalists. He also studied with Dr. Paavo Airola Ph.D., and through these educational endeavors, Dr. Barmakian based his Can-Gest formula on a perfect combination of herbs that nourish the digestive system. We continue to provide Dr. Barmakian's original formula and ensure the quality of all ingredients used. Enhances the digestive function and improves the assimilation of nutrients into the system. Associated with liver function and supporting the pancreas. Known for stimulating the activity of the digestive system. Known for its use as both a gentle, natural, vegetal laxative and as nutritional support for the bowel and digestive system. Known for its use as a demulcent (a soothing effect on the mucus membranes) and an emollient (having a soothing effect) that is useful for inflammation and irritation of the alimentary tract. Beneficial to soothe the digestive system and known for its nutritional support for gas, nausea and diarrhea. Known for its relaxant qualities on the central nervous and digestive system. Known for its nutritional support of the digestive system. Common name is Butter Tree. It has been used as a cholagogue (to increase the flow of bile) and is known for its nutritional support for the liver and gall bladder. 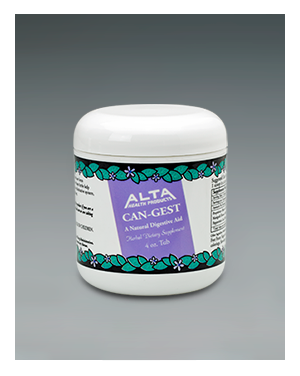 As with all of Alta's health products, Can-Gest is safe to take while nursing and/or pregnant. It is also safe for children but consider one capsule to be a dose; capsules can be opened and the contents mixed with applesauce (or any other food your child likes). (Capsules) as a dietary supplement 1 to 4 capsules a day. (Powder) Approximately 1 scoop (included) or 1/4 teaspoon, per serving, 1 to 3 times a day mixed into any hot drink. The Alta Health Products Proprietary Blend of: Boldo Tree Leaf, Marigold Flowers, Alder Buckthorn Bark, Mallow Leaf, Peppermint Leaf, Balm Leaf, Orange Tree Leaf, Combretum Leaf. Other Ingredients in capsules: gelatin, microcrystalline cellulose. Other ingredients in powder: maltodextrin. Free From: Sugar, salt, yeast, wheat, soy, dairy products, colorings, flavorings or preservatives. No GMO. Gluten Free. Alta Health Products are available through most of the Distributors that supply your local Health Food Stores, and on-line stores. Prices may vary and some may include shipping fees.